I’m not sure but I think the 100x100 Birthday Swim was invented by our beloved Grand Coachie Hillary Biscay. 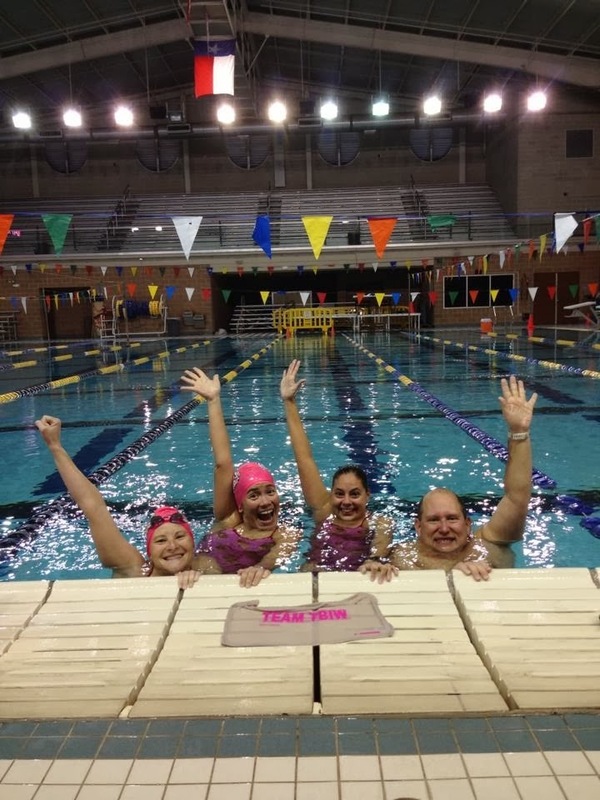 This is when you get together with your friends and celebrate a birthday (or any special occasion, really) by swimming 100 100s (and now, for the feats of strength!). If you swim in a pool that’s measured in meters, that’s 10,000 meters, or 6.2 miles, aka swimming a 10k; how super cool is it to be able to say you’ve done that!? Gyms (and the pools within) are closed on Christmas day. Everybody’s busy (rightfully so, it’s a family day!). It’s cold outside, so nobody wants to! Note: Be careful what you wish for. About a month ago, I was indulging in some complaining on this subject and Linda (high school swim coach extraordinaire!) said, “Hey, maybe I can open the pool at Blossom on Christmas day. Let me check with my aquatic director.” And just like that, we were able to get into the beautiful Davis Pool and swim 100x100 on Christmas morning! Linda’s swim kids wrote the set for us and Dawn weighed in. 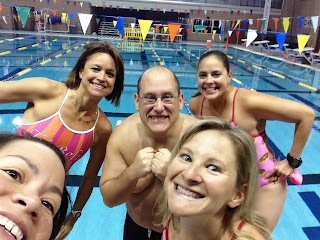 On Christmas morning at 6:30 am, Linda, Orissa, Dawn, Herb and I met at Blossom to start our swim. At first, we all had our own lanes, but after the first 20 100s, Dawn told me to come and share hers. “Sit on my feet for these band-only 100s,” she said. Band-only is where you tie your feet together and swim with only your arms, dragging the rest of your body behind you, and it’s hard. 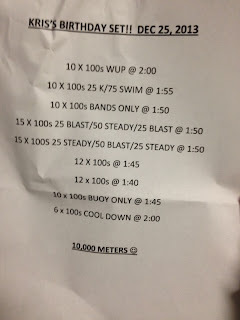 The most I’ve ever done is 25 meters at a time with a bunch of rest. So basically, 45 minutes into our 4-hour workout, I entered hell, even with the benefit of drafting off Dawn. She dragged me through the next 15x100 too, telling me to “fight” and “stay with it” as I gasped at the wall, touching and going, while she and Linda got AT LEAST 10-15 seconds rest on each interval and didn’t even look like they were breathing hard. “I can’t believe I asked for this. It’s my birthday, I did this to myself, what the f, OMG we’re not even halfway through this, it's my birthday and they are HAZING ME” is what was going through my head. Herb was doing his own thing in the lane beside us, Dawn and Linda were gliding effortlessly side by side as I gasped on Dawn’s feet for 25 meters and then lost her on the first turn each time, and Orissa tried valiantly to keep up in her own lane on the other side of Linda. As we worked through a set of PBB (paddles, buoy, band) with aching shoulders, Dawn commented that she needed to leave for Santa duties. At this exact time, Brian showed up to join us. 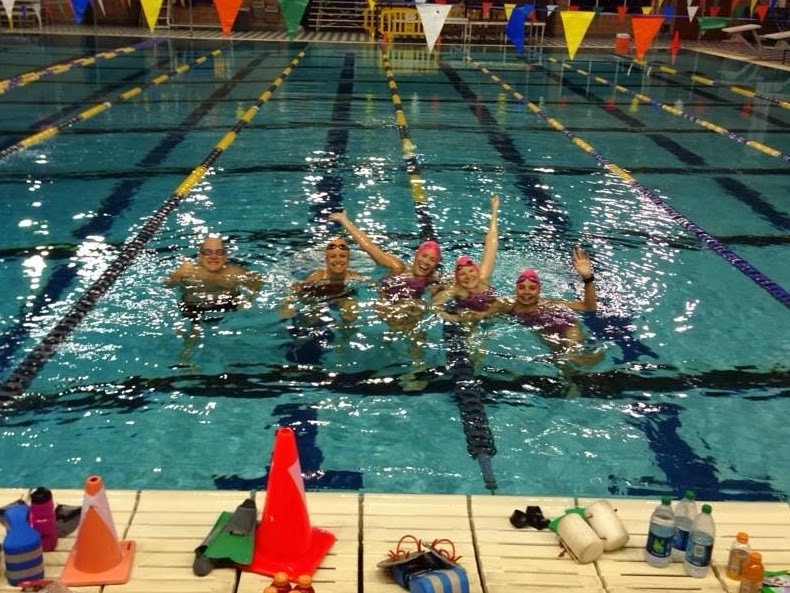 We all hugged and squealed and took a photo for posterity, and then Dawn left after 5400 total meters. And Linda said the best words of the day, “I hate PBB! Let’s get rid of it! Let’s kick with fins and kickboards instead!” A glimmer of hope – the workout was changing. Orissa and I smiled joyfully as we kicked and gossiped and chatted for 1000 meters. It wasn’t all fun and games though. Linda made us work hard after that, but finally we were finished, and after congratulating ourselves and each other, we headed out to spend time with our families. I can't even describe how grateful and filled with love I am for my fun, fearless friends who came to swim with me early in the morning on a day that’s reserved for family. I would already have chalked yesterday up as one of the greatest birthdays of my life due to the swim party. But I had another surprise in store. Later that evening, I opened my present from Robert. The packaging said Quarq on it, but I couldn’t believe that that's what was really inside the box. It’s probably just an accessory of some kind…nope – it’s a power meter. Quarq Elsa power meter OMG and it’s mine! Matt and Dawn have been preaching power to me forever and for almost as long as that, I've been trying to figure out how to get my hands on a power meter. It's certainly not a "need" but it is most definitely a "want." I don’t understand how all three of them were able to keep this a secret from me, but they totally did. I was even in Bicycle Heaven on Friday, crying about power to Matt as he kept a straight face and told me not to believe in Santa Claus. And Dawn, who can never keep a secret but always tells you not to say anything, was able to hold it in while I begged her on Saturday to hit up Meredith Kessler for a used Powertap hub. Even Hillary knew…sneaky sneaky sneaky. It's so cool that the people that I hold in highest regard were all conspiring together on this fabulous surprise. The best gift, though, is that my amazing hubby totally gets it. As I sat there speechless over his gift, he quietly said to me, “You had to have it. I want to help you to be great at this.” He gets it, he gets me; I am the luckiest luckiest luckiest. Happy holidays and happy training, and here's to a fantastic 2014! About 6 weeks ago, I looked at my running log and thought, "Awesome! I have 2 months until the end of the year, I'm going to hit a thousand miles EASY!" I was sitting at like 930 miles for the year so far. For the last few years, my standard running goal has been to run at least a thousand miles in each year. 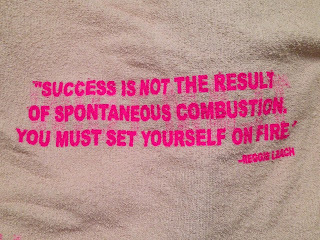 The first time I accomplished this, I was in Las Vegas with Robert celebrating New Year's Eve and our wedding anniversary...and at 6 pm on New Year's Eve, I was on a treadmill running 7 miles because I needed to make a thousand. (I think/hope I'm not alone here with silly goals like this. There was a storyline on a recent Modern Family in which Phil set and accomplished a similar goal of walking "to Canada" on an elliptical trainer. So at least the guy who wrote that part of that episode knows what I'm talking about here.) That experience taught me two things about myself - that I enjoy fun, ridiculous, useless goals. And once they're set, I'll do anything to achieve them. So...6 weeks ago when I looked at my running log, I could have stopped there. But I didn't. Instead, something in my brain said, "Ok, you're going to get a thousand running miles easy. But how does it compare to last year?" Hmm. Now I needed 77 more miles, to make it to 1077 and match last year. And I could have stopped there. But I didn't. Instead, I thought, "Hey, I wonder how this year's bike and swim mileage stacks up to last year's?" The bike was easy peasy to achieve, just 200ish more miles. But the swim was not such a piece of cake. I sent a note to Coachie - "In each of the next five weeks, I need to swim 8625 yards, bike 30 miles, and run 29.8 miles." and she replied back - "No problem." I saw her the next night for a pain cave trainer session, and we talked about the goals. She said she totally understood because she loves numbers too. And then she said something like, "I think you got this, you can totally run 30 miles before the end of the year *eyeroll*" and I said, "You know those miles I sent you were per WEEK, right? Not total." And she said,"Yikes! 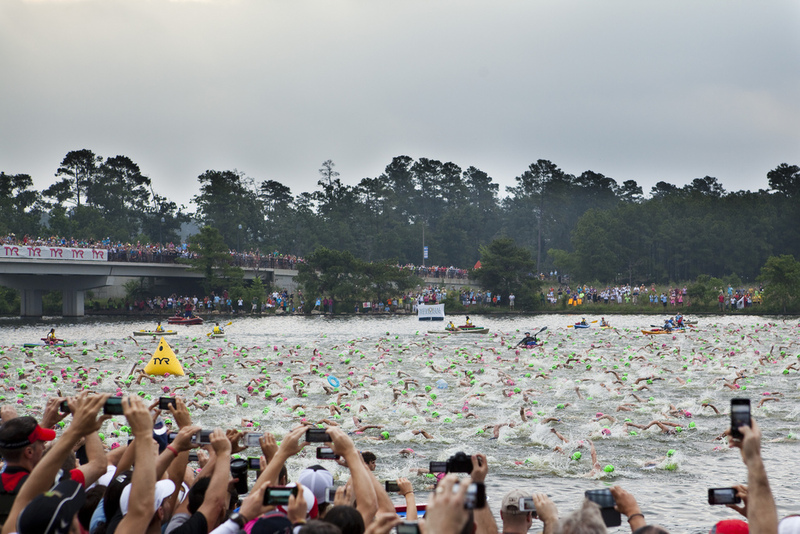 Ok, yeah, I think you can still do it for the bike and run...but probably not the swim goal." And with that I set out to do it. I crammed 30 miles of running into the next 3 days. Of course, then I promptly went back to Las Vegas on vacation for Robert's birthday and missed an entire four days of workouts. As soon as we got home, I once again became laser focused on the goal. This meant that in addition to my usual daily workouts, I was running 1 or 2 miles at work during lunch with a couple of my coworkers (trying not to get too sweaty while running during the workday is fun - and by fun I mean not fun). 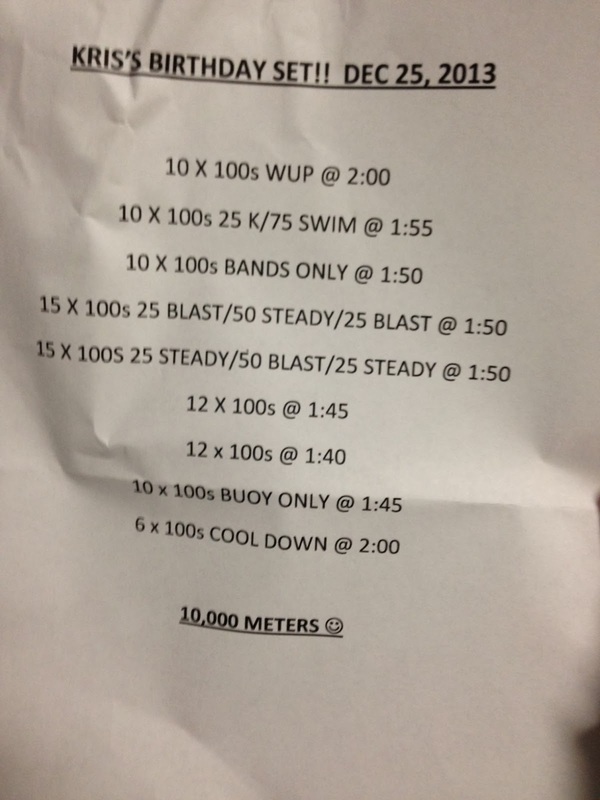 I've been adding an extra 200 or 500 or 1000 to the end of swim workouts. I'm 100% aware that all of this is "junk miles" but I don't care. I have become obsessed with making this happen! So here I am with 11 days left in the year and I need 12,000+ yards of swimming and 55.5 miles of running before end of day on December 31. I met the bike goal earlier this week (woo hoo!). I told the girls about my ridiculous self-inflicted challenge, and Aixa decided to join me on my quest - she's aiming for 1000 miles of running this year too, and she's got about 50 miles to go. I think we're going to make it. And FABULOUS LINDA, our fishy friend, the high school swim coach, has determined that she'll help me out by swimming a 10K with me ON CHRISTMAS DAY - my birthday - how cool is that!!? We'll see how this all shakes out. It has certainly made the last few weeks of training more fun and motivating at a time of year when it can often be anything but. Happy holidays! This weekend, a few weeks into the "off season" (which actually means marathon season - which is really not "off" at all), I took Coachie up on an offer to ride with her. It would be foolish not to accept an invitation to ride with Dawn - my take on this is always that if I ride with her, it's going to hurt but I'll get so much more out of it than riding by myself (or with the girls for a donut) that I have to do it every time I can. So I went with her a couple of weeks ago and it was a total sufferfest (for me. For her, it was a "social ride" which meant she chattered easily the entire time while I tried not to die). It ended up being a 4 hour ride, during which we rode down Krueger Canyon (the last time she rode there, she crashed and broke her collarbone, so that was a fun memory to revisit), and back along some horrible new chip seal and down some access roads to major highways that I'm still trying to block out of my memory. The last hour and a half was torture for me, but afterwards, I thanked her and told her I would love to ride with her again, anytime she'll have me. That opportunity came up again this weekend. She extended an invitation to the Tri-Belief group and I was the only sucker taker. It was cold and windy and we headed up Blanco Rd. at 12 mph. At first I wondered if she was waiting for me, but of course she was struggling too, leading us into the 15-25 mph headwind and providing a (very welcome) draft for me. I love riding with Dawn because I can watch what she does and copy it. Just like following Hillary down Mt. Lemmon at camp, I followed Dawn through all the twists and turns, up and down hills, watching how she turned and how she leaned and when she stayed in the bars and when she sat up. By trying to do what she does, I'm learning to be more comfortable on my bike. Woo hoo! Oh, and also we took a break to take some photos of the cows. At one point, Dawn had to do a 15 minute effort into the wind, along a straightish road with rolling hills. As I watched her disappear into the distance, I concentrated on my own effort - stay in the aerobars. Keep making smooth circles with your feet. Don't let up, keep riding strong. Thoughts came up, "I'm afraid of the crosswind - what if I crash? I'm scared to turn corners." I refused to let my mind use those words - scared and afraid. Instead, a mantra bubbled up, which I repeated throughout the ride - "I am strong, I am calm, I am confident." (Sounded quite a lot like Stuart Smalley or the nanny talking to the little girl in "The Help" - haha - but it worked!) I thought about racing - I don't have to catch up with her, I just have to know I'm going as fast as I can. When I finally did reach her (she had turned around for me), I felt proud of my effort. The reward was a screaming tailwind on the way home. Of course by this time, almost 3 hours later, I was cooked. Dawn instructed me to get on her wheel, never falling more than a bike length back - we only had an hour to get back to her house. So we blasted back down Blanco Rd, this time at 40 mph. And although I was suffering, I continued to repeat my mantra, and I stayed on her wheel (in zone 4. Zone 4!!! On her wheel with a tailwind!!!). I'm putting this in the bank for the next racing season. I am strong, I am calm, I am confident (and doggone it, people like me!). Ride on! It all started with a coupon code last December. First, the marathon date changed from mid-November to December 8, which would mitigate the risk of miserably hot temperatures that have happened nearly every race day since the race's inception in 2008. "Come join us for cooler temps!" they said, "And here's a coupon to sweeten the deal!" Even after suffering through the marathon with Shelly in 2011 and shrieking "I'm never doing a stand-alone marathon again!" to everyone who would listen, I admit that I'm the one who rallied my friends and talked them all into signing up (sorry, girls). Then, a few weeks later, it was determined that the new date conflicted with the Dallas White Rock Marathon, and Competitor Group moved the date back to November 17. In their defense, they offered a refund for folks who had already registered. We opted not to take it. I had two conversations with Dawn about this race. One was back in early fall. With the hamstring issues I'd been having and my A race 3 weeks prior to the marathon, I questioned training for and racing the marathon. Should I switch to the half? 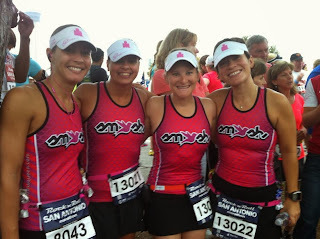 At that time we determined that I'd train for Longhorn and do a quick little ramp up for the marathon afterwards with the understanding that I would be training for a "fun run" and should not expect to get a new marathon PR. With Longhorn on my mind, this was fine with me. The second conversation was the night before the race. "What's your goal?" Dawn asked. Well, it's a fun run with the girls. "OK, but what's your actual goal?" Honestly Coachie, I am terrified of The Marathon. I have run 4 of them. The first one was a disaster. The next 3 all resulted in the same time (4:46). I am stuck with this terrible marathon PR and I really don't want to get that time again. Not to mention the forecast for the day was for brutal heat. She listened and we put together a plan: Run by feel, take off the heart rate strap. Go easy at first, pick it up after a few miles, find a pace group to chase, don't fade, crush the last 6 miles. And stay positive the whole time. No negative thoughts allowed. Got it? Race day came and as promised, the morning was 70 degrees and dripping with humidity. Aixa picked me up at 5:45 and we drove to the very well organized shuttle at the AT&T center. Rode the bus to the Alamodome and headed straight for the porta potties. These occupied our time for the next hour or so. Pee, get back in line. Pee again. Met up with Linda, Brian, and Orissa in our corral (13) and we were ready to begin. As we inched towards the start line with the thousands of other people around us, I was filled with pride over how cute we looked in our Smash kits and did not feel nervous about the day. I ducked into a porta potty right before we got to the start line. This proved a smart move because this was the first marathon where I didn't have to stop in the middle of the race! The girls and Brian waited for me and we crossed the start line. Immediately, Aixa and Orissa were off to the races. I knew that if I followed them, I'd suffer later, so I stuck to the plan of going easy the first few miles. Linda and Brian stayed behind with me. With 26,000 entrants in this race, if you start in a later corral like we did, the first 12 miles of the race is really hard to navigate and get into a rhythm. The water stops are chaos and there are people everywhere, walking, run-walking, running, stopping dead in their tracks in front of you. Every corner is like a turn buoy on the swim in a triathlon - everyone gets bunched up and you have to avoid smacking into people, getting squashed into a curb, or having someone step on you. Trying to negotiate all of this is tiring. If I did this race again, I would be very tempted to lie about my pace so that I could get a spot in one of the first corrals. I had brought a small bottle of water with me so that I wouldn't have to try to maneuver into the first few water stops, and I think this really helped. They changed the course this year. The race started at the Alamodome and wound up St. Mary's street to the zoo. Then, to my delight, we ran up and over Stadium Drive past the main entrance of Trinity University and down the other side along the access road of 281. I spent all my time through this section enjoying the huge crowds of students who had shown up to wave signs and cheer, and yelling to Linda "I used to live in that building!" and laughing. We ran past the lacrosse field and the tennis courts and the gym and I recalled so many snippets of happy memories from college. Up Ledge Lane and past Prassel Hall where the kids were hanging off their balconies watching and cheering. What a rush. And, all of it was nicely shaded. With all this distraction, I almost didn't notice that we were running up some pretty tough little hills. We ran back into downtown on Main, and at mile 7 I got to see Robert, Andre, Gina, and Rebecca, who were spectating (Gina snapped this photo). At this point, Brian had run up to catch Aixa and Orissa, and Linda and I were running together. We were chatting a little bit, and I was listening with the other ear to a fabulous new mix on my iPod that Shelly and Valerie had helped me create last week. The course divided between half and full marathon at mile 12. After running off to the right towards the missions, finally we had some breathing room. Mile 13.1 came and went. I looked at my watch and observed that if I ran even splits (hahahahaha) I would be able to get a 4:30. I picked up the pace a little. By this point, Linda and I had stopped talking and had our game faces on. It was then that I started to notice that we were passing people. We were passing everyone. I began counting. Between miles 13.1 and 15, we passed 150 people. Both of us were sticking to our nutrition plan of a gu every half hour and a saltstick every hour. Gatorade every time we passed an aid station that had it (note: there are 20 aid stations advertised on this course. Every other one has Gatorade. As someone who is used to a buffet of sports drink, gu, ice, and other treats at every mile in WTC triathlon races, I do not like this, especially on a hot and humid day). Up until mile 16, we had followed Coachie's rules. We never stopped running, even through the aid stations. I kept the happiest, most positive attitude I've ever had, singing along to my iPod, chattering to Linda when she seemed to need it. She did the same for me. And then at mile 16, we stopped to walk through a water stop and eat a gu, and kept walking for a little longer than we needed to. Looked at each other and smiled, ashamed. And then started to run again. At mile 17, the course veered off into a somewhat hilly 2 mile out-and-back. I looked at my watch and noted an 11:07 pace. I said to Linda, "Ok, every mile after this at 11:07 or better is a victory." She said ok and told me that her heart rate was getting high. I was thankful to have left my heartrate strap at home. One less thing to worry about. Now was the time to see if I could stay positive. I was tested almost right away. I felt a twinge in my right quad, then a twinge in the calf of the same leg. Cramps. Nooooooooo! It's only mile 17! Ok, what to do. Take another saltstick, even though it isn't time. Stay positive. So I did. The cramp subsided. We saw Aixa and Brian heading back on the out-and-back while we were still on our way out. We never saw Orissa, although apparently at some point, we passed her. At an aid station around mile 18, I lost track of Linda and continued the rest of the race on my own. Saw my co-worker Vincent on his way out while I was approaching mile 19, and waved at him. Ok, he's a rookie, I can't let him catch me. As the wheels fell off at mile 19, I stuck to the plan. Although I couldn't help falling off the pace, and I had to walk to shake out cramps that were taking over both calves, shins, and hammys at the same time, I kept moving forward in the most positive fashion. The mantra "pain is inevitable, suffering is optional" was rolling around in my head as I sang Three Day's Grace's "Pain" (thank you Shelly for the song suggestion - it is a GREAT one!). I ran out of my own saltsticks and took salt packets from the medical tents to try to make the cramps subside, but it didn't really help. I'd have the same opinion of miles 19-24 if I was having a great day - that part of the course sucked big time. It was all within the Mission Trail park, along a concrete sidewalk that is just like the greenbelt that Coachie is always telling me not to run on. Hot, exposed concrete. No breeze, no shade, and sparse aid stations. Everyone was walking. But I thought to myself that this run course looked like the run course of Ironman Arizona, the race that I DNF'd without making it to the run exactly one year ago today. Today was the day I was getting to run a marathon instead of sitting in an urgent care in Phoenix with road rash. 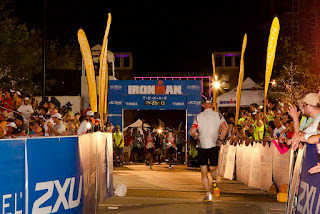 So I tried to imagine that I was running at Ironman Arizona, and with that, I maintained focus and positive energy. Around mile 25, I realized that I wouldn't be getting a new PR, and that in fact, I wasn't even going to match my dreaded 4:46 3x marathon time. Turns out there is something worse than 4:46 - it's running slower than 4:46. As I ran back onto city streets and made that final turn onto Cherry Street towards the Alamodome, I saw the time slipping away, but I kept moving forward toward the finish line. The finishers chute was surrounded by cheering spectators telling the runners what a great job we were doing. I took it in and smiled. My final time: 4:51:10. My second worst marathon time ever. But you know what? I am prouder of this race than all the rest, because I was able to stay relentlessly positive. I also feel like my running is the strongest it's ever been, and that on a nice day, I would have had a wonderful race. Brian and Aixa had crossed the finish line 25+ minutes earlier, new PRs for both of them on a brutal day - amazing! I wandered through the finisher's area sort of floating and grabbing every beverage that was handed to me - chocolate milk, frozen amazing Jamba Juice smoothies, Gatorade, water. Was able to find Robert and Andre and stand around for a minute talking. Found Orissa, whose hip flexor was seizing up. Orissa told us that she'd caught up with Linda and forced her to get medical attention, and that Linda had had to DNF due to heat exhaustion. We went into the medical tent and talked with my friend Tim who was working there. He told us that the course had been closed just 30 minutes before due to the heat - the out-and-back at mile 17 had been closed and people were being sent straight past it to the finish - anyone who hadn't reached mile 17 yet would only be permitted to run 22 miles that day. The temperature had matched the record for that day - 87 degrees. Found Linda at another medical tent and then we went and caught the shuttle back to the park and ride. We were able to laugh as we recounted tales of the day. On the way to the race, we had talked of doing the San Antonio/Las Vegas double-double, which is actually a thing because both races are on the same day - you run here and then fly to Vegas and run again. On the way home we made a pact to never let each other sign up for another full marathon again, unless it has a swim and bike before it. I've made this promise before at the end of every marathon that I run, and this time is no different. And every time I said it, I've had to retract it the next day when I say, "I know I can do better. I want to try again." I know I can do better. I want to try again. 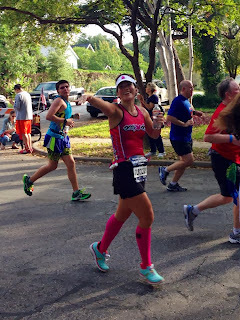 Austin Marathon, February 2014? Maybe we can find a coupon code. I've been reflecting quite a bit in the last couple of weeks about triathlon and motivation and I thought I'd throw some of my thoughts down here. First though, I want to say thank you to the folks who contacted me after Longhorn - I appreciate the advice and kind, kind words - thank you! I also received the question: why put yourself out there like that, you big whiner? I fully admit that I might have sounded like a bratty child throwing a temper tantrum about a day that didn't go the way I wanted it to. But I feel like it's important in the documentation of my journey to not only publish the awesome stuff, but to describe the bad days too, because it's honest. 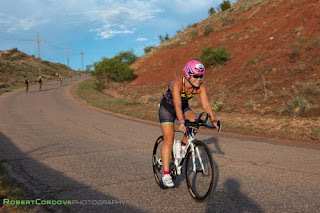 So in the aftermath of the "bad day," (which after some reflection, really didn't turn out to be so bad) I'm here thinking about triathlon and what it means to me and why do I do it anyway. 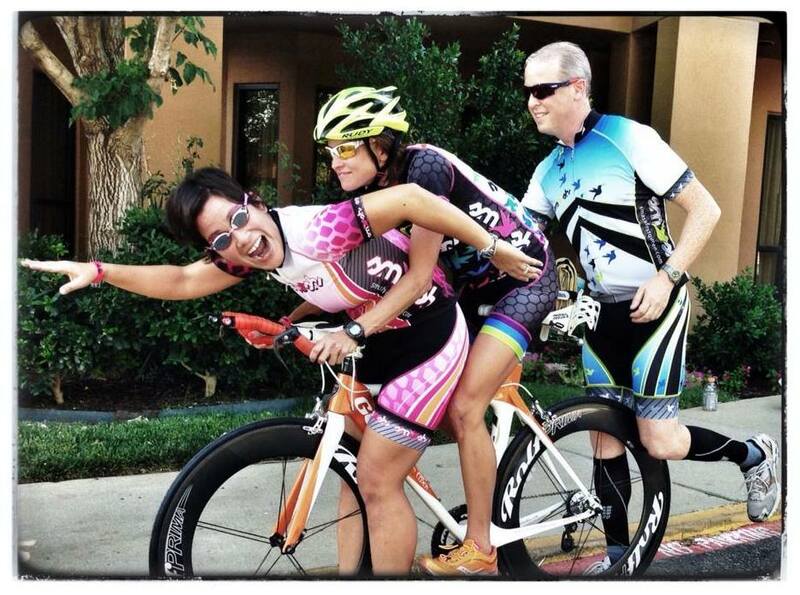 Dawn had Shelly and me answer this question when we began training for our first Ironman. We both struggled with it for weeks (What does it meaaaaan!? ), and we were surprised to find out that simply "to find out if I can" is a sufficient answer if it means something to you. The problem is that after you find out that you can, the question becomes "Now what?" or I guess, "Now why?" So now I'm sitting here questioning: why do I do triathlon? Why am I trying to go faster? What is going to keep me motivated to continue to push myself, to get up early to train, to (try really hard to) eat right all the time, to go to bed early every night, to make it hurt in training, to NOT QUIT when a workout isn't going the way I want it to, to repeatedly choose exercise or sleep over social events, to stay positive, to keep running, swimming, biking? I need this answer because I need to know and understand what motivates me. I need to reach and hold on to it when it gets tough, whether during training or racing. In a conversation with Robert last week, I came to the answer: I want to be great at something. Not just good. I'm "okay" at lots of things, but I want to be really great at something. I don't think "something" necessarily has to be triathlon, but that's what I've picked, which is lucky because I truly can say that I love to train! That's a good thing because clearly "to be great" also requires "to do a whole lot of hard work." Then the question is: how do you define great? A while back, "great" was to FINISH a 10K, marathon, short course triathlon, Ironman. Now, it would be absolutely absurd for me to say "I want to qualify for Kona/70.3 Worlds" or "I want to win my age group." 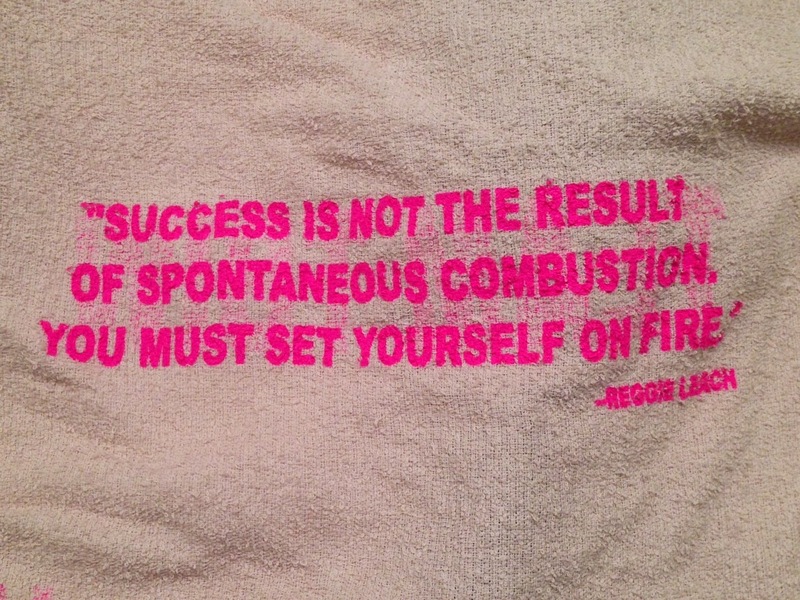 I'm all about striving for attainable goals, and those are completely out of reach for me. But maybe, just maybe, one day they won't be. The great thing about triathlon is that it truly is a lifetime sport. So "being great" will mean being better than yesterday, every day. This is something I can work with. Onward! I've had lots of good intentions for posting the last few weeks. The problem is that every time I think to myself "oh that's a good one! I'll write about that when I get home," by the time I sit down to write, the feeling that I had has been replaced by a different one, sometimes good and sometimes bad. So today I just decided to write about this roller coaster that I've been on. The month of September has been a good one for training, and the reason why might surprise you. Here's what happened. We were off work for Labor Day and Robert and I have been getting his Harley ready for me to ride with him (he's had the bike for years, and I've never had any desire to get on there with him, until Sons of Anarchy came along, don't judge me). So I have this adorable pink helmet and the motorcycle has a seat and pegs for me, and we just need a day to get out there and practice. After a regular weekend of tri training, we hopped on the Harley on Labor Day and went for a successful ride for an hour an a half around all the roads that I usually ride my bicycle on. It was exhilarating (ok, at first it was terrifying and I almost didn't make it out of our neighborhood without throwing up from fear. But that's a whole other story). The problem is that about an hour into the ride, my same old hamstring was screaming at me just from sitting on the motorcycle, and when we returned home I could barely walk. For almost a year, I've been figuring out ways to "work through" this hamstring issue without solving it. I've been telling myself that it doesn't hurt while I'm riding/running, so what's the big deal if it hurts all day at work? This summer, I was beginning to dread the running days because every time I ran, I knew I'd be in some pretty solid discomfort for the entire day afterwards. But it wasn't "affecting my life." Well, now it was. And I would be damned if I didn't get to ride around the hill country on the back of the motorcycle holding onto my very own Jax Teller because of a tri injury. I asked Coachie what to do and she begged me to go and see Justin Martindale over at Promotion Physical Therapy. She has so much confidence in him and he really helped Shelly back in the fall before IMAZ, so I decided that even though physical therapy had not seemed to help that much before, that I needed to give this another try. This experience has been far different from my PT experience in May. After 3 weeks of 3x a week at Promotion and following all the rules, I believe this is helping me to get better for real this time. The real benefit is coming from having my coach and physical therapist talking to each other about my progress. After a conversation with both of them, we determined that I needed to "push it" on a week's worth of workouts and "see what happened." Here's where the roller coaster comes in. I followed their directions and started pushing it. And because I wasn't afraid to hurt myself, I broke through left and right in swimming, biking, and running, hitting intervals I've never hit, reaching speeds and heart rate zones that I've never been able to grasp and hold on to before. This happened consistently for 2 weeks and I know it was all because I put fear away. Even with harder workouts, my hamstring was feeling better too. Yesssssss! Well then, after a particularly awesome weekend workout, I was doing a pretty benign swim on Tuesday and I felt sharp pain in my hip flexor. By the end of that day, I could barely walk. Luckily, I had a PT appointment. Justin couldn't figure out what I'd done, he tried to make my hip physically feel better, but mentally I was a mess. I went home and cried and felt like I was back at square one. And then 2 days later, it feels better, the hamstring feels great, I'm probably one PT appointment away from "graduating," and I'm back to smashing workouts and feeling super strong. Roller coaster. I hate roller coasters. I've made a decision to just hold on and go for this ride. Longhorn 70.3 is in exactly one month. I was tempted to file this one under "related shenanigans," but it turned out to be quite a race! Of course Shelly has been my training buddy and bestie for years and years, and it's no secret that I've been missing her quite a bit in training lately due to her pregnancy. It's been great to be able to walk on breaks with her at work and swim with her - but that's no substitute for the daily smashfests on the bike and run that we used to endure together. I don't think she'd have any issue with me complaining about this. What surprised me is that she misses the training and the racing too - I thought she'd be so wrapped up in nesting and whatever else you do to prepare for her little (now cantaloupe sized!) bundle of joy that she wouldn't really be missing all the triathlon stuff - but she totally does. 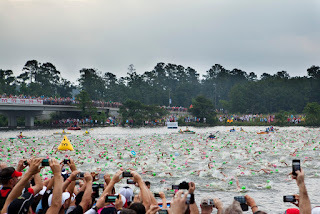 So, because swimming is the one thing she can safely and comfortably do, we signed up for the relay race at the Small Texan out at Boerne Lake - with Shelly as the swimmer, me as the cyclist, and Orissa as the runner. The original Iron Whiners in action at this (sort of) Olympic distance race (1500 m swim, 45K bike, 10K run) under the name "San Antonio Smash." All three of us talked about this being "just for fun," (ahem, isn't it all!?) but when race day came, of course we each had our goals. 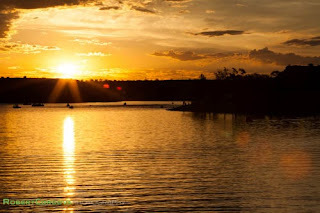 Shelly and I drove out to the lake together and met Brian and Orissa there. I have never done a tri relay before and it was quite a different feeling. Not the same pre-race butterflies as usual. Of course, because she was going first, Shelly had all of the butterflies racing around in her belly along with the little one. We set up in transition and chatted with friends. Attended the pre-race meeting at the lake front, and the men's wave was off. Orissa and I hugged Shelly and sent her down to the water's edge. We watched from the boat ramp as the women and relays took off swimming 5 minutes after the men. Go Shelly! Her little yellow cap went off into the distance among all the green caps - there were only 5 relay teams for the Small Texan. Orissa and I ran a quick (and exact) three-quarters of a mile to warm up and then we set up inside the transition area. Orissa would grab the chip off Shelly and transport it to my leg, and then I'd run out with my bike. As we stood there, the first racers started to come in. What a different experience that was! Some people are crazy and rushed and panicky in transition; others are smooth and quick. Some sit down and chat for a while. We saw one of the other relay people standing at the other side of the transition. I joked with him that I would chase him on the course later. Roland ran through transition so quickly that he forgot to take off his swim skin - Orissa and I screamed at him to take it off and grabbed it from him at the bike mount line before he took off to ride. Apryl ran through in first place. And then came Shelly! She had crushed the swim and made it up the long boat ramp and into transition in 31 minutes! We were in third place and it was my job to keep us there. Off onto the bike! I ran out of transition and rushed onto my bike, smiling for Brian's photos and yelling at Linda and Heather who were cheering (so cool to have a cheering squad!). Out onto the I-10 access road and down the route that we used to ride every weekend when we were newbies a few short years ago. The road was familiar with its chip seal and bumps. 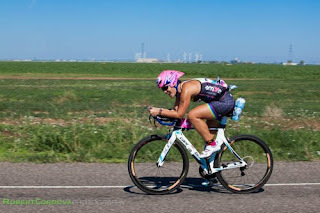 My heart rate was high and that was okay - even though Coachie had told me that I should plan to run afterwards, I knew that if I raced the bike right and treated it like a time trial, I wouldn't have anything left for a run and that was okay with me. I was flying. Racing past people and feeling super confident. The road was bumpy - it rattled my right elbow right out of my bars twice! My aero helmet felt hot at first but then I stopped noticing it. The route took us straight out to the Waring general store, and then we turned back towards the lake. Right before the turnaround, I caught a glimpse of the relay rider that I had joked with earlier. He was already coming back the other way. I yelled "I'm coming after you!" or something ridiculous like that, and made it my plan to catch him. I love out-and-back courses because you can see where everyone is. You can also get encouragement from your friends - I enjoyed exchanging greetings with Carlos, Roland, Apryl, and others that I recognized as we flew by each other. The way back to the lake went by quickly as I picked off more of the riders in front of me. Then, instead of turning into the lake, we had to ride past it, down a road that I've run on a few times but am not as familiar with. It turns out that there are some pretty nice hills out that direction too, and after hammering it back down the access road of I-10 and expecting more flat-ish terrain, it's a nasty surprise. But never mind, just keep on pushing because you don't have to run afterwards. I raced back into the lake, and as we approached the last half mile, I saw the relay rider...and he was sitting up and slowing down. What? Who does that? I flew past him, screamed and fist pumped like Mark Cavendish winning a sprint finish, and hustled into transition. I think I probably looked like an enormous fool, but it was sooo much fun. I never saw the relay cyclist who was in first place, but I was happy with my time - an 18 mph average! My fastest ever out in Boerne. After I handed off the chip to Orissa, it took some time for me to collect myself and I barely had the energy to walk to rack my bike. "I'm not running," I told Shelly, Brian and Linda. Brian and I took a dip in the lake and cooled off. Then it was up to the top of the reservoir to cheer Orissa in. Orissa crushed her run in the ridiculous heat on a course with no shade. She outran the relay runner behind her and put us in 3rd place by 40 seconds. Yahoo! I could tell that she was totally spent just like I had been. AND! She achieved her goal of a sub-9 pace. I poured water over her head and we all screamed excitedly at each other about what a great day it had been. Orissa dipped in the lake and then we went to eat some delicious barbecue. They even served beer! I found the relay cyclist that I had been chasing and thanked him for motivating me to ride faster. He laughed and said he somehow could tell I wasn't joking when I said I was coming for him. It turns out that their team won first place in the relay division because their runner ran a 35 minute 10K. Amazing! 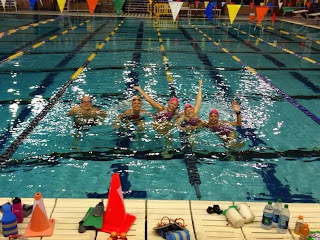 The girls and I agreed that being beaten by a relay team of 3 male Marines was not too shabby. The second place team ahead of us was quick and strong too. We were proud to be the only all-female team. And then when the awards ceremony came around, it was even more fun to be recognized as the only 4-man relay team, with Shelly's little cantaloupe joining her on the swim. What a fun day! If you haven't done one before, you should try it. If for no other reason than to just smash yourself on the bike and see what you can do when you don't have to save yourself to run. It was a fantastic day out at the lake with great friends at a great race. I would definitely do this again - we don't even need to have a baby along for the ride as an excuse! 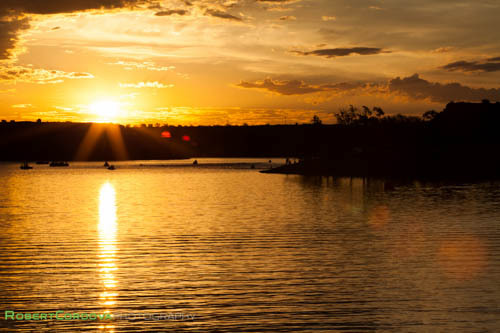 The Buffalo Springs 70.3 is considered one of the most difficult courses on the half-Ironman circuit, and it's right here in Lubbock, TX, about 6 hours from San Antonio. Last year, when I was unexpectedly offered a discounted entry fee as part of a tri club, I thought, why not try an epic race and see what happens? 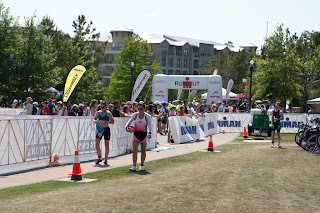 Well, I had an amazing day in 2012 and even achieved a new half-Ironman personal record time of 6 hours, 13 minutes. So this year, when Dawn and I met after Ironman Texas to decide "what's next," I jumped at the chance to do it again, at Coachie's suggestion. (It's only 6 weeks after IMTX? Can I really do it? "Sure, you have a ton of fitness in you and you had a huge taper for IMTX due to injury and illness. Of course you can! 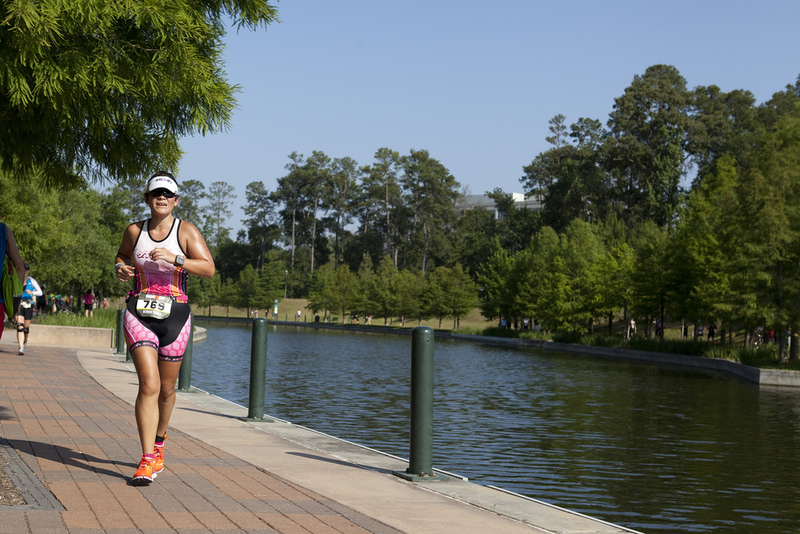 Just think of Ironman Texas as your last long training day for this race." Okay, Coachie.) Bonus: Dawn was also planning on racing Buffalo Springs. 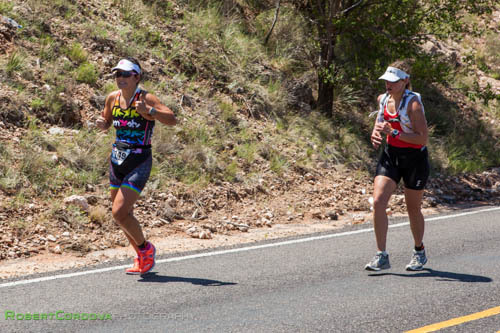 The course is tough because you battle hills, heat, and wind on the bike and the run. The swim and transition area are at the bottom of a (beautiful!) canyon, so the first few hundred meters of the bike course are up a huge hill, climbing out of the canyon. There are a couple of big hills out on the bike course, and because it's always windy in Lubbock and the course is made up of 2 out and backs (imagine one of those pointy barbecue forks with 2 prongs), you ride in all different directions, so you get headwind, crosswind, and tailwind at all different times. The run has 3 long, steep hills spaced pretty evenly through the course, and even has its own "energy lab" section, named after a particularly difficult stretch of the Ironman Kona marathon course that is completely unprotected from the sun and the wind. And it's Lubbock at the end of June, so the temperatures are usually in the 100s. An added bonus for this race is that we have some good friends who live in Lubbock, so we made plans to get together with them after the race. Robert and I drove up Saturday morning for the Sunday race, with a plan to arrive in time for packet pickup and a warm-up ride and run. Everything went as planned and we arrived in Lubbock around 2 pm on Saturday. In and out of packet pickup/expo, and we headed out to the lake to make sure we could remember how to get there. It had been raining in Lubbock (weird!) and it was freakishly humid outside. The roads were wet and full of puddles. As we parked the car at the lake (trying not to get it stuck in the mud) to get my bike out for a practice ride, Coachie called. Don't do your warm-up stuff, she cautioned. It's too hot and humid. Get to your hotel and rest! She didn't have to tell me twice. I felt sick. Humidity! Just like Ironman Texas. This is not going to be good. I was counting on a "dry heat," which I typically handle far better than humidity. Pre-race Smash shenanigans with Coachie and Alan. At 4:15 on race morning, I woke up and checked the weather. Cool temperatures but raining. ARGH. Looked on Facebook and secretly hoped to see a post from the race director offering apologies that the race was cancelled. Nope. Fine then. At the lake, the parking situation was not good due to the rain/mud, so Robert dropped me off at the transition area and drove to find another place to set up to take photos. Alone for the first time ever before a race, I felt sick and nervous as I wheeled my bike down the hill into transition to get set up. 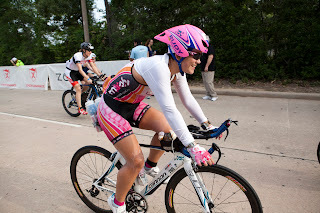 My goals for the race were to be brave (i.e., stay in my aerobars) on the bike, and to PR the run. How could I make the first goal with wet roads and hills? The forecast said that the rain was passing through and would stop by the time the race started. But the roads might still be wet, I whined to myself. Everything went smoothly and very quickly. I socialized with some friends from home, Kelly, Bob, and Roland. I saw Dawn briefly. And then, before I could blink an eye, it was time to race! We lined up for the beach start and watched the pros go. Two more age groups and then my wave was off. Started my watch, ran into the water with all the women 44 and under, and started swimming. There was less contact than last year because the women were split into 2 waves instead of one, but the sun was out and was directly in our eyes. I sighted off the silhouettes of the swimmers in front of me and prayed they were going in the right direction. Gorgeous sunrise; yes, this really is Lubbock. Up the big hill on my bike and out onto the 56-mile course. Saw Robert at the bottom of the first big hill and screamed incoherently at him - it was so great to see him. Rode up the next big hill and settled in. I was actually talking to myself out loud, "That swim time, ridiculous! No way! Ok, forget the swim. Settle down. Focus." My heart rate was high (168) - focus on getting that to come down. Get some nutrition in. It's funny - when I have a bad swim, it affects at least the first few miles of the bike and I have to force myself to get over it. I didn't expect the same thing to happen with a good swim. It took some serious self-talk to get myself to focus on the task at hand. No need to fake this smile. After the first few miles inside the park, we got out onto the farm roads and I was flying on the bike course. Over 20 mph and passing people. The roads were dry, for the most part, except for a few deep puddles that filled the whole road, that I went through praying that there were no potholes hidden underneath. I got down into my aerobars and stayed there. The first hour of the bike flew by. Throughout the ride, I watched the average speed on my Garmin fluctuate between 17.8 and 19 mph. I really wanted to ride faster than last year, and to do that, the average had to stay above 17.8. Saw Coachie and Carlos out there on an out-and-back, and they shouted encouragement. 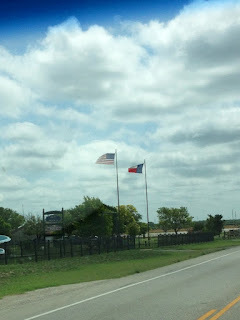 Then the wind picked up (or, we had a tailwind for the first part of the ride. I'm not sure which). For a good 45 minute stretch, it was tough and I was struggling to go 15+ mph. Kelly and Roland passed me and I started to get discouraged. Come on Kris, you're a better cyclist than this. Stay with them. But I couldn't. And I kept thinking about the massive headwind that we had last year for the last 10 miles of the bike, and knew I wouldn't get a bike time better than last year - impossible. Kris! Focus. Stay in the moment. And then, as I turned for that final stretch, I realized that the wind pattern was the exact opposite of last year. Tailwind! Woo hoo! The final 10 miles were a blur and I went screaming down the road at 25 mph. Even the headwind that I had to fight going back into the park couldn't bring the average back down, and I ended up with a bike split 4 minutes faster than last year. On the way back into the park. Seeing Robert and Tony cheering at the park entrance was a huge boost, too. I screamed at them about how great I was feeling. The run course went out past the park entrance in the opposite direction of the bike route, and I knew that they would be expecting me soon on the run. I think that made me move a little quicker. I hustled through T2 and headed out onto the run course. The first 3 miles of the run inside the park were a blur. I felt like I was on familiar ground - I remembered the course well from last year and particularly remembered enjoying watching the pros come in on the the first 3 miles of the out-and-back course. So inspiring to see them racing by to win when I still had 13.1 miles to run. They are so unbelievably fast...in fact, Greg Bennett, the winner, posted a new course record of 3:48! I saw Robert on the way down the second hill near mile 4, and yelled joyfully at him. Throughout the run, I ran steadily and never stopped to walk, not even on the hills. I actually felt great the whole time. There were a couple of times in the last 3 miles that I felt my calves and shins wanting to cramp, but each time, the feeling passed. The entire time, I just kept watching my watch and calculating what I needed to do to get under 6 hours. I had this goal in mind and planned to achieve it by running 20 minutes faster than last year - well, now I had some padding with faster times than I'd counted on for the bike and the swim, so I didn't have to. Which is good, because I didn't. With a 2:13 split for the half marathon, I was only 8 minutes faster on the run than last year. But I will take that, because I know I was moving as fast as I could the entire time. Ok, maybe I didn't feel awesome the whole time. Trying to fake it here. I knew that I was going to make my goal of a sub-6 hour race, and as I approached the final half mile, I started to get really emotional. I needed to do well at this race. After spending a year and a half preparing for Ironman, then DNFing in November at Arizona, and then coming up way short of my time goal at Ironman Texas, I needed that feeling of racing. I needed the confidence and pride that it brings. I didn't race at Ironman Texas; I survived it. I raced Buffalo Springs and I'm so proud. 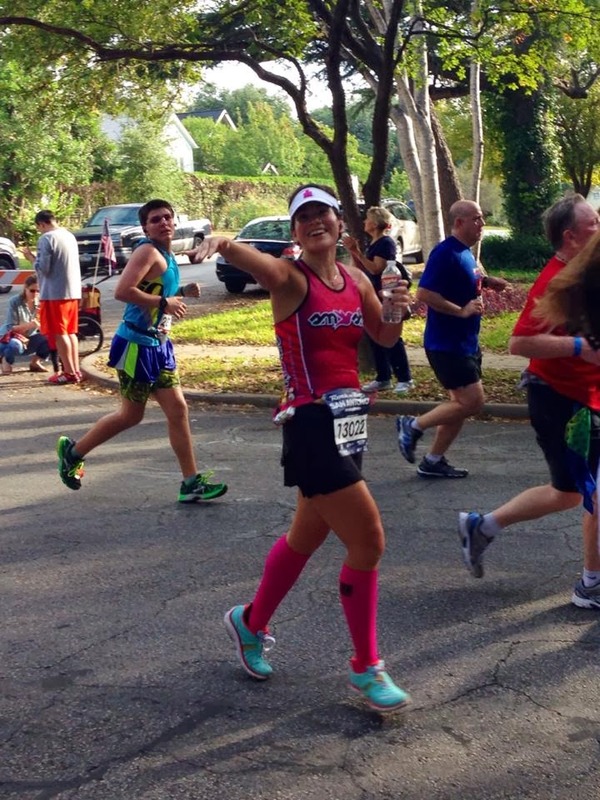 I was feeling all of this as I ran down the final stretch, and I started to cry - an ugly, hyperventilating, dry heaving, sobbing cry that left spectators looking somewhat horrified and Robert, who I passed without a word, looking concerned. And then I crossed the finish line with a time of 5:57 and ran straight into the arms of Dawn, who was there waiting for me (she had finished nearly an hour earlier, in first place in her division) and I started weeping and she was hugging me screaming at me about how f-ing proud she was. Such a cool, ridiculous, overwhelming moment, and I was just thinking and probably yelling out loud, "I LOVE THIS SPORT!" I really do. I am totally, completely in love with the sport of triathlon. 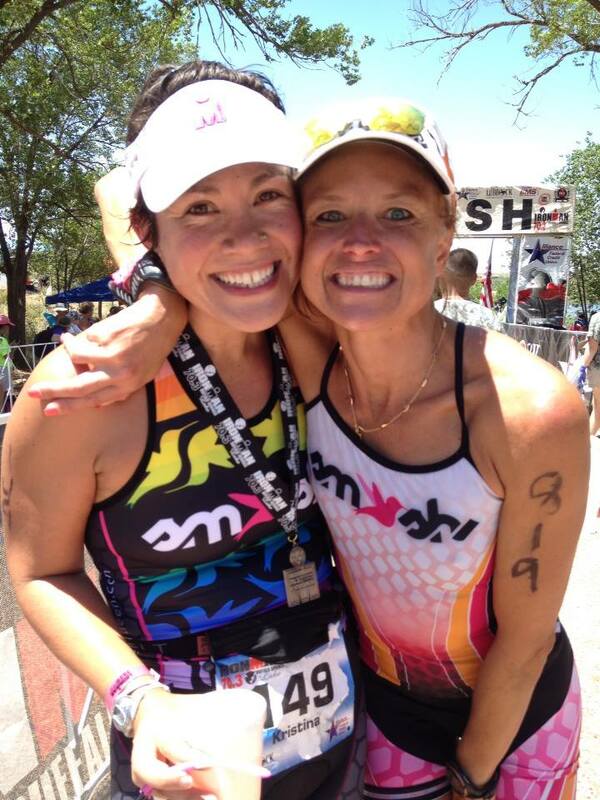 And I know now that the 70.3 distance is my soulmate! Here I am with proud Coachie. Sniffle. We packed up pretty quickly after the race and headed back to the hotel to clean up. Went to have some lunch with Dawn and then the plan was to go to the awards ceremony and then Robert and I would head to Tony's house for dinner. It would be cool to see Dawn get her award for first place in her age group - how awesome is that!? But I had another reason for wanting to attend - the top finishers in each division get offered a spot at the 70.3 championship race in Las Vegas, and if they don't want the slot, it rolls down to the next person in that age group, and then the next person, until someone claims it. You have to be present to get it. There was a very slight chance that I could claim one of these spots if it rolled down far enough. I can't imagine anything cooler than racing in Las Vegas with all the pros and the best athletes in the sport. I had finished 17th in my age group, so it was a very outside chance. To make a long story short, I didn't get a Vegas slot. It was pretty cool to watch it happen though. They went through the awards, one age group at a time, starting with the oldest age groups first. As each set of athletes came up to claim their awards (a buffalo statue and a bottle of wine for the top 5 finishers), the announcer called the names of the winners, pictures were taken, and everyone clapped politely. Then he asked the important question of the first place finisher - do you want to go to Vegas? This is when everyone listened a little closer. If they said yes, the crowd clapped politely. If they said no, the announcer asked the second-place person, and so on. And everyone listened intently to see what each person would say. Coachie on the far left - 1st place AG! In most cases, the first and second place athletes declined the slots, usually stating that they had already qualified at a previous race. Once everyone on the podium had been asked if they were interested, the slot would roll down in that age group. They brought up a projection of the finishers in the age group and just started reading down the list of names until someone in the audience yelled out "YES!" Most of the slots were claimed by someone in the top 5 athletes. A few age groups rolled down, though. In my age group, the second Vegas slot rolled down to maybe 8th place. In the male 35-39 age group, because there were more competitors in the group, there were more Vegas slots available, and the last one rolled down beyond 25th place. It really is about the luck of the draw! The whole weekend was pretty awesome. Instead of epic weather, we got beautiful, unseasonably cool temperatures to race in. 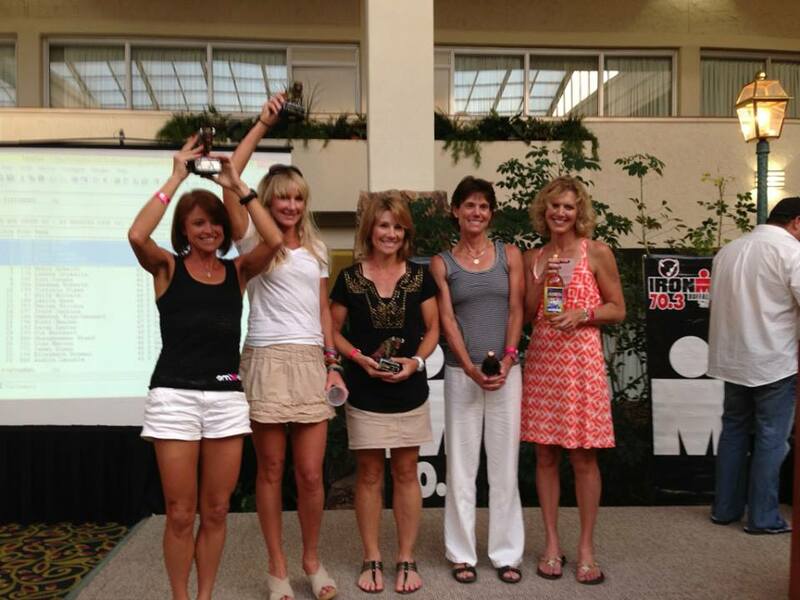 It was great to be there to see Dawn standing on the podium in first place at the awards. 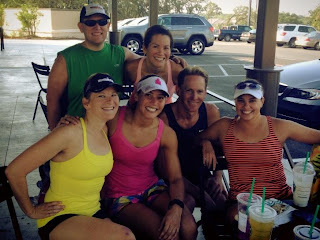 I loved chatting with nervous new triathletes at the start line, socializing with friends before and after the race, and making new friends out on the race course (hmm, I suppose I lost focus for a few minutes on the run after all). I really loved seeing Robert so many times out on the course, and it was so cool that Tony came out to cheer too and to learn a little bit about the sport from Robert. I enjoyed and appreciated the words of encouragement from other competitors out on the course, and the energy and joy coming from spectators and volunteers. There's something really special about the triathlon community, and I'm so grateful to be a part of it. All in all a great weekend of racing! 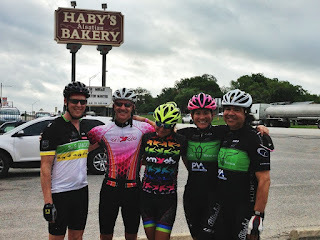 Castroville Time Trial "Race Report"
"Race report" is in quotes because Coachie sent me and a couple other kids (Alan and Jeff) out to do this 40k time trial not as a race, but as a benchmark for training for the rest of the summer. "You're not racing," she said, "it's just a hard effort." So I should ride as fast as I can for 25ish miles. "Yes." How is this not racing?? I don't know, but whatever. 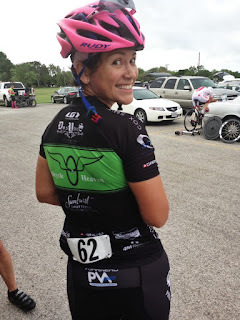 This was my first bike race - that is, a race where I ride my bike without swimming first or running after. At Coachie's direction, Robert and I parked at Rio Medina and then, to warm up, we rode 6ish miles to the start, which is at the Iron Haus gym just outside of Castroville. The race is an out-and-back course from Castroville to about 6 miles past Rio Medina, and then you turn around and head back. For the most part, it's flat with a bunch of turns. I ride this road a lot in training, and it's always super windy. Today was no exception. The tell-tale flags were standing straight out. This means that there would be a tailwind on the way out and a headwind on the way back. Robert and I saw Coachie on the way to Castroville (she rode from her house!) and rode in with her. We had preregistered for the event and we walked inside the gym to get set up to race. This race was sooooo not like a triathlon. It started at 8 am, with riders starting every minute. We arrived at 8 am (not 2+ hours early to set up in a transition area). We were given our start times (9:00 and 9:01 for Coachie and me, the times were given based on when you arrived) and a little number to pin on. That's it. No bodymarking, no stickers for your bike or helmet. No timing chip. No commemorative T-shirt. The state time trial race is at the end of June, so apparently a lot of people were out racing today to practice for it. There were 70 or so riders altogether. Lots of disc wheels, aero helmets, skinsuits, and aerodynamic shoe booties. One thing is for sure - nobody shows up at a 40k tt to check it off their bucket list. This was not like your local 5K, triathlon, or even Ironman, where there's always a ton of people who are just there to finish. Everyone here was serious. They were all set up in the parking lot warming up on their trainers, or riding back and forth on the road. Since we had a whole hour before our start time, we rolled over to the gas station in Castroville to get a snack. 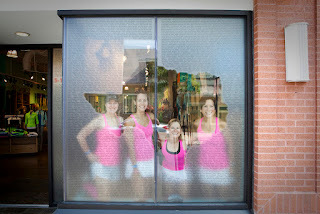 Coachie wouldn't let me have any donuts but she did let us take our photo in front of Haby's. We ate our snack (peanut butter Snickers for me! ), rode back to the start and got ready to ride. I was worried about rolling down off a ramp or having someone holding onto my bike and counting me down Tour de France style, but I didn't need to be concerned. The start line was a couple of cones next to a clock. One guy stood there yelling out people's numbers and sending them off one at a time. He offered to hold my bike for me and let me clip in to get started, but I declined. I was afraid I'd topple over in front of all these roadies. When my turn came I was literally shaking with fear. Took off tentatively and couldn't clip in. Got down in my aerobars and let the tailwind carry me. My heart rate immediately shot up to the 170s, which is ridiculous for me. I was concerned but couldn't get it to go down. Kept on riding, got passed by Jeff after about 4 miles, kept on riding. Ok, don't let Alan pass you. The first 10k went by and it was fine. Kept on riding. Started to get tired in the places that I usually get tired, the long straightaways that have a beastly crosswind. Started to worry about what the way back would feel like. Reached the turnaround (a single cone set up in the middle of the road, with Jimmy Britton standing there with a flag yelling "turn around!") and I turned around. This is when the headwind smacked me in the face and my 22 mph turned into 15. Argh. Oh well, keep fighting and try to stay over 20 mph average for the ride. I watched my average speed creep down as my heart rate went up...by the end of the race it was 183 (seriously, I didn't think it was possible to reach that on my bike; I can barely hit that while running hill repeats), I felt like throwing up, my feet were hurting and I was watching my garmin like a hawk, willing it to say 24 miles. When it finally did, a peloton went by in the other direction shouting encouragement and saying "you're almost there!" I made a final push for the finish line (another couple of cones) and then kept riding after I passed it because I couldn't stop. Everything was shaking. I have never, ever worked so hard on my bike. It was awesome! We stood around for a few minutes to get our results; I'm pretty sure I was dead last of the 6 or so women who raced today, with a time of 1:16:23, that's 19.5ish mph. Not too bad. But next time I want to go faster, of course! Loved the new experience, loved sharing it with Robert, who had his own adventure riding off to La Coste with a group while I was racing. Loved the simplicity of this really well-run event. I loved it so much that I asked Coachie if I can do it again in two weeks, and she said yes. Woo hoo!